We would like to wish you a Happy New Year and may 2017 bring you lots of happiness, success and good health. It’s been a great year for Rosie’s Cleaning Service and we’ve received many lovely reviews from satisfied customers. We’ve enjoyed helping hundreds of clients in the Santa Barbara area keep their homes and offices clean, and we look forward to fulfilling your cleaning needs in 2017. After party cleaning service – if you have a big event or party coming up at home or work, Rosie’s can provide a quality clean-up service for you. Carpet, window and blind cleaning – just ask and we can provide these services for you. Moving out cleaning service – make sure you get your rental deposit back by hiring Rosie’s to give the property a thorough clean after you’ve moved out. Dog sitting and house sitting – going away for a while? 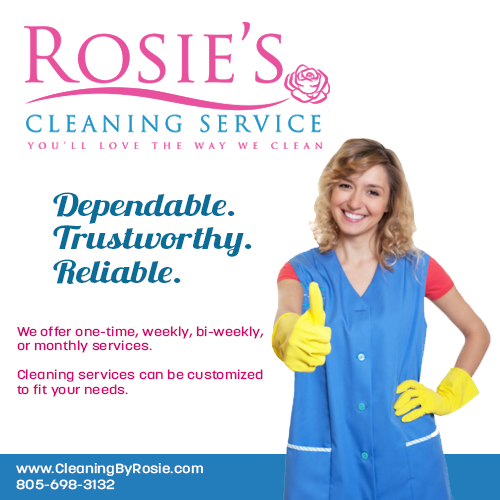 Rosie’s cleaning service is bonded and insured to provide sitting services for your home and pets. SPECIAL OFFER: We’re offering a winter cleaning special from now until Jan. 3rd. Get 6 hours of cleaning for $220 (reg. $350). STILL LOOKING FOR THE PERFECT GIFT? EVERYONE LOVES A HOUSE CLEANING! Thank you for all you support and we look forward to cleaning for you in 2017. Santa Barbara dance theatre – watch a stunning performance by the university’s resident professional dance company at the Hatlen Theatre. Tickets cost $17 or $13 for concessions, shows take place throughout January. Bridal Show – planning a wedding? Then don’t miss the largest Bridal fair in Santa Barbara from Noon till 4pm on the 15th January. The Show takes place at the Earl Warren Showgrounds and features over 70 wedding exhibitors. Tickets cost $10 general admission or $25 for VIPs. 6th Annual ‘Winter Wine Classic’ – join famous Californian winemakers on the 21st January in the Pavilion at The Fess Parker: A Double Tree Hilton Resort. Taste a selection of over 100 wines and gourmet food from some of Santa Barbara’s top restaurants. Tickets cost $90 for general admission and $110 for a VIP early pass. Blush Restaurant Downtown: Blush will be having a NYE dinner celebration in downtown Santa Barbara. Blush is a cozy restaurant and lounge that will be open from noon until 10:00 p.m. You and your guests can sit back and relax while their chefs do all the cooking. After preparing so much food and party essentials for a family reunion during New Year’s eve, I’d rather have someone clean my house. 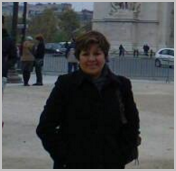 A reliable cleaner such as Rosie’s cleaning service is one of the best choices there is in Santa Barbara.